The enticement, fatalism, and police repression that the rank-and-file Wobbly Van Dilman drew in his cartoon “And the First Great Step is Education” personified the forces standing between working-class self-educators and their lofty goals. These were very much present dangers, as opposed to the memory of child labor depicted in John Anderson’s “Out of the Darkness.” Anderson, after all, was a success story; with barely any schooling he rose to the rank of Vice President in one of North America’s larger trade unions. Dilman was still looking and climbing up. Still, the “workers college” that Anderson’s drawing suggested as the place of enlightenment was somewhere out of sight. Other images suggested more definite objects of attention, sometimes the sun or a star, sometimes a union logo, and sometimes across great distances to symbols of political and intellectual power. Distance and attention signaled desire, or at least they advertised the things viewers ought to desire in the artist’s opinion. 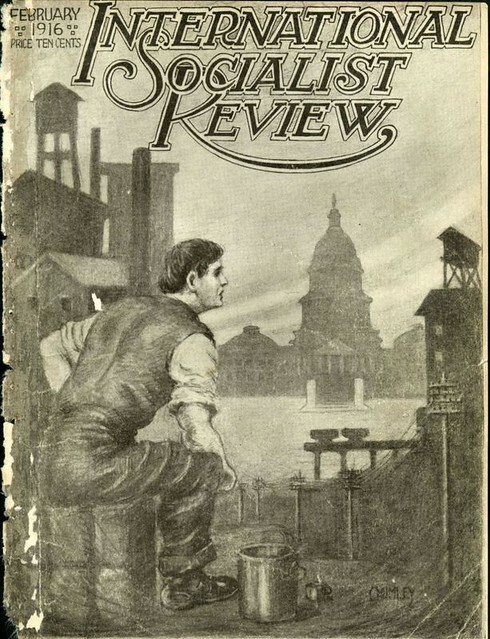 For instance, the cover of the February 1916 International Socialist Review (drawn by Stanford Chumley) pictured a workman sitting down to his lunch amidst factory buildings and power lines that open onto a view of a distant capital building. In the language of the Second International, workers want political power, and they can get it through the Socialist Party. 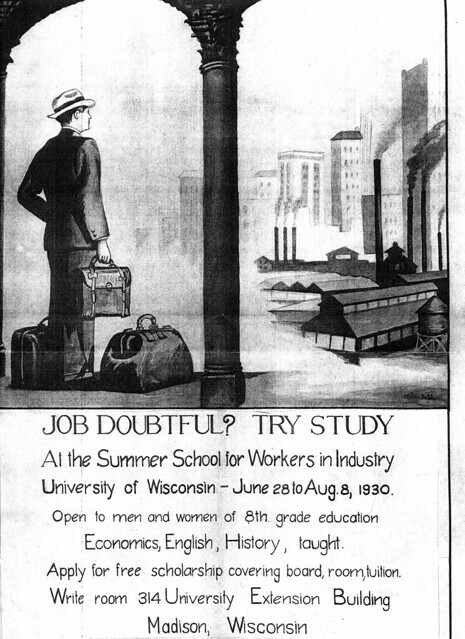 Recruiting posters for the Workers Summer Schools at Bryn Mawr and the University of Wisconsin played with similar imagery. In one, a women looks up from her sewing machines and busy work-mates to a cathedral-like university building atop a hill. Another (“Job Doubtful? Try Study”) reverses the view. A male figure dressed in a suit (presumably the worker addressed by the poster’s text) looks out upon an industrial landscape from beneath a archway that suggests a university building. Each of these seems to play off the idea that knowledge and power occupy high ground that allows for a clearer view than possible in the cluttered and crowded working-class neighborhoods. Like the temple on a hill, the rising sun is an old symbols that artists and illustrators have deployed to represent everything from national power to religious conversion, working-class revolution and superior consumer products. By the 1920s the visual language of advertising, especially in mass market periodicals and product labeling, was accessible to people across the industrializing world, and we can see some of this in labor movement iconography. In fact, some IWW cartoonists of the 1930s parodied product advertising, but that’s for a later discussion. Instead, let’s look at two very different examples of the rising sun image, one symbolizing collective power and the other private escape. 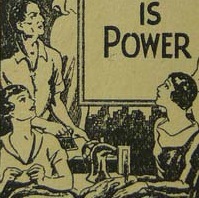 The title page of the 1935 ILGWU Education Department pamphlet “You and Your Union” (detail to the left) shows two women and two men looking up from their sewing machines and irons to a female figure. She holds aloft in one hand the logo of the union (radiating shafts of light), and points to the words “Knowledge is Power” at the center of the image. Under her arm she holds a set of books. 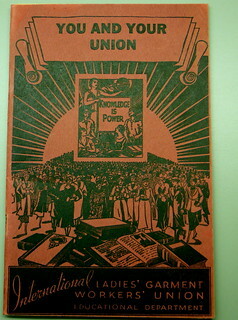 The message here, I think, was not simply that the union, or education, was something workers desired. There is also a sense of the distance between workers and their goal, and the relative clarity of the object they gaze toward. But this image begs my original question: what does powerful knowledge look like? We get a better sense from the pamphlet’s cover. 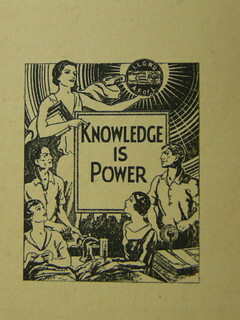 Here the “Knowledge is Power” image sits atop a rising sun, and out of the sun well-dressed working women and men stride forcefully toward the reader. A pile of books, some open to text and images, lies between the viewer (a rank-and-file union member) and the powerful ranks of labor. The composite illustration links the individual and the shop group to the overall collective force of the union. It suggests both that reading is a crucial instrument of collective power, and that collective power makes books accessible as desired consumer products. Books, as Nan Enstad argues in her study of women garment workers (Ladies of Labor, Girls of Adventure), symbolized and embodied leisure time and an imagined “good life”—time beyond the power of the factory clock and the rhythm of the machine. That is why the marching workers in on the cover of “You and Your Union” are so well dressed–they are not going to work. They are going out on the town. But if books symbolized leisure, nothing could symbolize free time more effectively than a book held, but unread. What a luxury it was to have time to doze off over a good book! 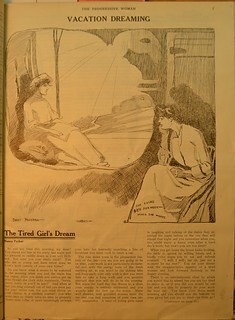 This was the message of a cartoon accompanying a 1912 short story, “The Tired Girl’s Dream.” In the story, a young woman sits alone in her tiny apartment dreading the coming workday. She is, by today’s standards, depressed because she simply moves between unrewarding work and her lonely apartment. She imagines herself sitting in the country, back up against a tree, a book open on her lap. But instead of reading, she gazes off into the distance at nothing in particular. Next up: didactic, heroic, and assertive modes of looking. This entry was posted in History, Iconography, Research and tagged iconography, labor history, print culture, radicalism, reading, visual culture. Bookmark the permalink.